The big news this morning was the announcement of the 2019 Fall Fling 500K with a half-million dollars going to the winner of the 2019 Fall Fling Friday race. It will be the celebration of ten years of Fling racing at Bristol Dragway, the place where it all started. As for today’s ATI Performance Products Friday, some lucky and talented racer will be walking away with $50,000. However, things are pretty tough here as for the second day in a row, the previous day’s winner was beaten in the first round the next day, having to visit the “Divas Help Desk” in order to buyback into eliminations. Last night’s Racepak Thursday’s winner, Jeff “Slushy” Burns, must have hit his slushy machine a little hard last night as in the first round this morning, Michael Davis defeated Burns and earned himself the Bounty Award, a set of Lindsay Racing Products front wheels. At the round of nine left were Wednesday winner Rocky Pintavalle, Seth Phillips, one of the “voices of the Fling” and a former Fling winner Jared Pennington, Sugar Shane Carr, former NHRA world champ Kevin Brannon, second generation hitter Wes Seigel, G-Dub Gary Williams, Jamie Holston and John Brown; definitely a who’s-who of hitters. In that round, Wednesday’s winner Pintavalle rolled on defeating Pennington with a perfect .000 reaction time which earned him the bye run the next round. The remaining survivors were Carr, Siegel, Williams and Brown. While Pintavalle rolled through by virtue of the bye, Seigel took out Williams and Carr survived a double red-light with Brown. Semifinals had Seigel on the bye and door car versus dragster in Pintavalle and Carr for the right to face Seigel for $50,000. Semifinals and Pintavalle with his all-Mopar Duster, complete with a three-speed Torqueflite transmission certainly an oddity in this field, had the reaction time advantage over Carr and survived a double breakout affair to move him to his second final of the week against Seigel. In the final, once again Pintavalle had the reaction time advantage over Seigel and carried it through to what just might be the biggest win of his career. When the stunned Pintavalle exited his car in the winner’s circle, about all he could say was, “I’m exhausted,” but certainly $50K richer. JEGS Saturday will close out another year of Fling racing with a $20K to win affair while MotorManiaTV.com will continue streaming all the action live as it happens thanks to Mickey Thompson Tires and JEGS. Check with Drag Champ daily for the lastest in sportsman drag racing news and results. 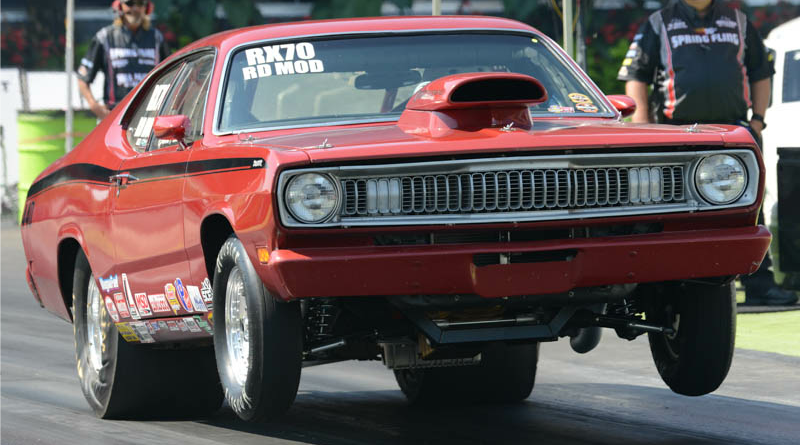 DragChamp is your source for big dollar bracket racing news online.